From the architect. The design theme of the Dingpu MRT station, which serves as both the Tucheng line’s terminus and the future Sanying line’s starting station, differs from that of other stations. 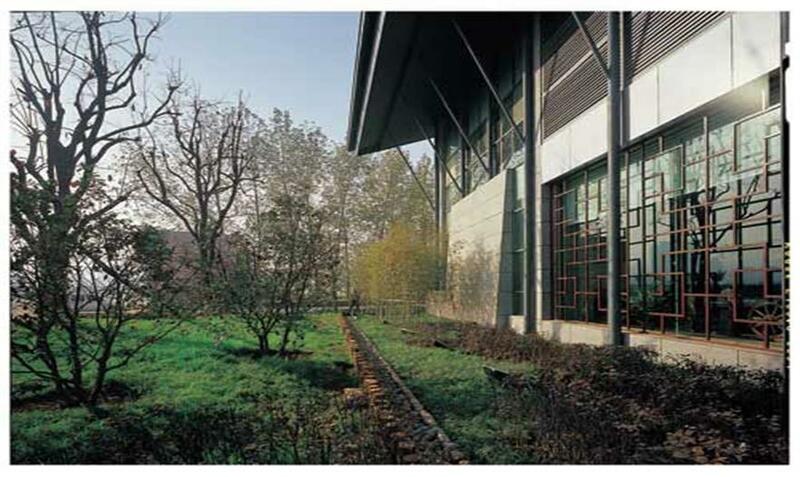 In response to the evolutionary transformation of Dingpu from an early industrial (coal) township into its present status as a technology center, historical context and contemporary urban flux have both been incorporated into the station’s architectural design. Serving as the end-point of an underground line connecting to a future elevated line, the interior of the station is analogous to the transient qualities of light in relation to time. The character "C", representing carbon, is adopted as a graphic icon, and implies the revolutionary progress from coal mines to high-tech carbon nanotubes.The use of natural light as a sustainable design element also sets a precedent for subterranean transit stations in Taiwan. Sunlight is captured through a row of reflective solar tubes running the length of the station mezzanine. Accompanied by supplemental light fixtures, natural light from the collectors resembles vibrant sunbeams that create virtual atriums, intuitively guiding passengers through high traffic areas. During inclement weather, the collectors are shielded by transparent enclosures for protection. Integrated lighting fixtures reinforce the design theme by abstractly expressing light waves, halos and radiancy, appearing as patterns on the ceiling, floor and walls. Ceiling panels are arranged in accordance with the floor pattern. Programmable colorful LED light fixtures embedded in the concourse wall poetically reflect the changing environment. The steel spiral tube structure at entrance "B" further strengthens the natural lighting effect with its transparent enclosure.